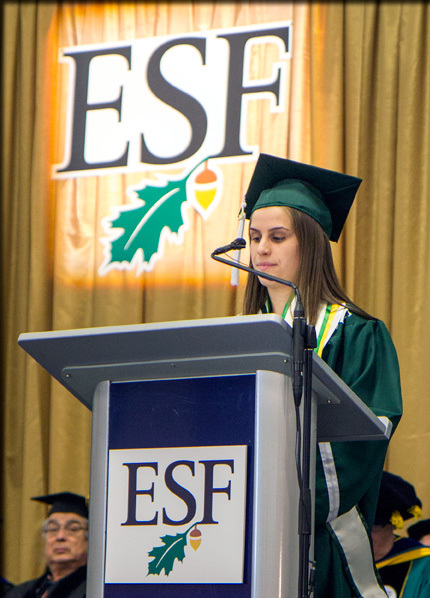 ESF celebrated the success of its latest group of graduates May 10 in a Convocation ceremony marked by accolades earned over the last few years and advice for the years to come. College President Quentin Wheeler, presiding over his first Convocation since taking office in January, said the graduates were leaving a unique institution that has given the students an opportunity to affect the future. "It's not too late to rewrite how the story ends. We must settle for nothing less than a sustainable future," he said. "The greatest contributions of ESF are still ahead. ESF was doing sustainability before sustainability was cool. The world's greatest problems have aligned with ESF's strengths." Henry Lickers, a biologist and longtime director of the Mohawk Council of Akwesasne Department of the Environment, received an Honorary Doctor of Science degree in recognition of his contributions to building cross-cultural partnerships for environmental sustainability. "Your dedication to your field reflects the mission of the State University of New York in general and the College of Environmental Science and Forestry in particular," said Provost Bruce Bongarten in bestowing the honor. "You embody the spirit of SUNY-ESF and serve as a role model and inspiration to our students, faculty and staff." In addressing the Class of 2014, Lickers advised the graduates to always think of themselves, their families, their nation and the world. "Take care of yourself, that's the only way you can fulfill your responsibility to the world," he said. If the graduates care for their families, those families will offer their support in return, he said, taking a moment to recognize Bev, his wife of 44 years, and his three children. Lickers told the graduates that when he was a student, he told his grandfather that he was fearful of losing his Indian self as he charted predator-prey relationships as part of his studies of science. His grandfather assured him that the numbers that danced across the page in the scientific charts were showing him how the world works while the song of the drum drove his spirit to understand how to live in the world. "He said, 'You're not losing your ability to be Native, you're gaining a new tool,'" Lickers said. The graduates also heard some advice from one of their own, class marshal and speaker Maureen Bishop, who graduated with a B.S. in environmental science. She took her classmates on what she called a journey of reflection, asking them to remember where they were and what they were thinking four or five years ago and to then tune out the distractions and celebrate where they were at that moment. "Take time to give yourself some credit," Bishop said. "You have worked too hard not to celebrate what you have achieved." Then she invited them to look at the future and to pursue their passions rather than wait for things to happen to them. "Don't stress that the journey is different than you think it will be," she said, adding, "I hope your future involves running toward (your passion) and not from it." "My dear friends," she concluded, "we did it and I cannot wait to see what we do next." The ceremony also included the presentation of the senior class gift by class Chair Joseph Piazza. The gift was a Power Tower station, used for recharging personal electronic devices, to be installed in Moon Library.